In my attempt to do something writerly every day – or even more than one thing (because once I get started I want more and more and more) – I Googled “interviewing writers” so that I could listen to other people struggling with their work and find out what it took to make it. So, for some reason, the first writer I’ve been listening to is Martin Amis talking to Don Swaim in 1990 just after London Fields was published. I’ve never read Martin Amis and I’m not sure why. I feel awkward admitting that I don’t read contemporary English writers. It feels like a secret, like something I shouldn’t be telling people. But it’s something to do with class and voice and history and turning to books to be challenged, inspired, and/or reassured. I don’t find those things in English writers. Although having said that, it took me about 10 years of living in England before I could read Wuthering Heights and I was blown away. I felt reassured, taken by surprise. And I wanted more. 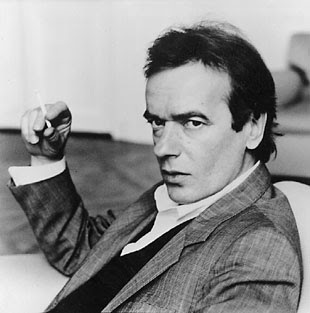 I have what Martin Amis called “a sticky finger attitude” to writing – I like to imitate and steal and copy from other writers. I am backed-up by TS Eliot’s saying that “Mediocre writers borrow; great writers steal.” So I think it’s about time I dived in and started reading the English seeing as I’m writing a book that is about English-Jewish painters, abook that is very much about London and varieties of Englishness. I’m going to start with Martin Amis. Something else he says in his interview which I liked was that he believed that everyone had a novel in them – “the difference is the writer finishes the thing.” He also advises the writer to “relax their intelligence” and to just write, to flow (yes, he uses the word flow), to stop editing as you go along.